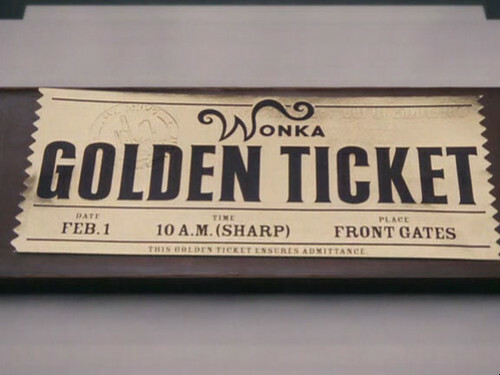 The Golden Ticket, a photo by pirateman2 on Flickr. I’m yelling at myself in a blog post title. And it should really be titled “Stop Ruining My Childhood Memories!”. Because I’m not a child now, so I can’t really ruin a childhood I am not in. I am in the one ruining this particular important memory though, which is why I am yelling at myself. I almost never watch “Faces of Death” or all the viral videos where you can see be-headings, torture, people getting shot, all of that stuff. I know that I am too fragile for it. I internalize it. Then I feel bad about our world and my existence in it. I get depressed. Since I know this about myself, 95% of the time I don’t look at the car crash when I drive by. There is 5% of the time where I’ll take a peek. I feel like everyone else gets to look, and they are having all the fun, so why can’t I be a man and look at it, too? It might be really cool. It’s not fair, I think, so I go against my own better judgment, and sometimes it’s actually fine. So having said all that, if you love the book “Charlie and the Chocolate Factory”, or any of Roald Dahl’s books, then please DON’T READ THIS. I AM WARNING YOU. If you only loved the movie, than you are safe. I used the image from the movie because I love it too, but you can put the two things in separate camps and be okay – I’m giving you that permission. Thank you for your time. P.S. The article itself is very well done and I enjoyed it, despite its content.